Strategies to Optimize Your Amazon SEO and Product Content Ranking – The Step by Step guide to ranking your products higher on Amazon. Today, we are targeting the biggest eCommerce kid on the block; Amazon. Amazon is currently the largest online eCommerce store pushing out some staggering numbers in regards to daily, weekly, monthly, and yearly sales. When it comes to optimizing your product pages on Amazon, there are a core set of items that you need to optimize to ensure that your products will rank higher within Amazon’s algorithm. Amazon’s algorithm is a bit different than Google’s algorithm but follows some similar core ranking factors. If you are familiar with running a Search Engine Optimization campaign, then this should come naturally. What exactly is a Buy Box? Enhancing product buyability of your product? Optimizing your product pages on Amazon is not always about ranking higher in Amazon search. 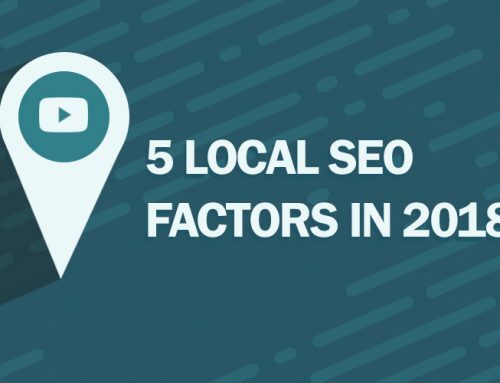 Sure, it has huge potential for success, but Google is also one factor that is not to be disregarded. Targeting the giant long tail search terms with Amazon in the phrase is a must as well. 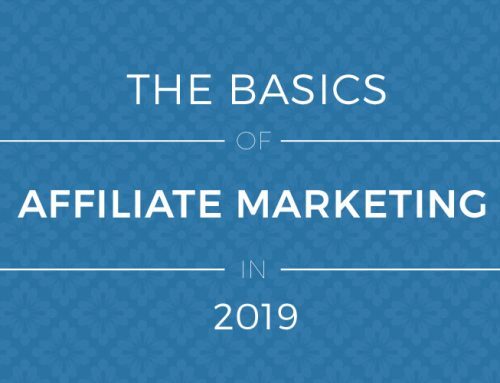 So, today we are going to focus on many different areas within these topics; on-page and off-page Amazon SEO or Amazon Product Optimization (APO). So what do we mean by “Amazon Product Optimization” and “Amazon Product SEO”? Amazon Product Optimization refers to how easy it is for potential customers to find your products in an Amazon SERP. As a seller, your goal is to boost overall traffic to a product’s detail page through optimization of your product pages. Keep in mind that most products on Amazon are sold by multiple sellers. As a seller, even though you want more people to view your product detail page, you must strategize to increase traffic to a product’s detail page only if you are well-positioned to secure the sale for that product. We’ll talk more about this later when we discuss product buyability. To be a successful Marketplace seller on Amazon, there are two main strategic concepts to keep in mind. First, it is important that potential customers can easily find your products using the Amazon search engine. In other words, you must focus your attention on improving product discoverability and your product page optimization. Second, you should aim at optimizing the conversion rate of your product detail page. It is not enough for customers to merely find your product on Amazon’s SERP (Search Engine Results Page). They must be converted from browsing shoppers to buying customers through conversion rate optimization (CRO). Thus, “product buyability” must be enhanced as well for a favorable sales outcome. What some Amazon sellers do: Some strategies for increasing your conversion rate is to create a wide variety of products within your one product vertical. If you are selling one item, why not repackage that item in a different way or in a different box. The goal here is to have hundreds of products on Amazon and 20% of your products are making 80% of your profit. There are some industries that can get away with this but most can not. If you have a product that you can duplicate and repackage in another format, version or model, that is a way great way to add unique items. If not, do not try to duplicate the same exact product with a different product title. What you should do: Optimizing conversion rates is about optimizing the ratio of traffic and sales to one listing – which influences the rankings for that one listing. When launching multiple products on Amazon just to sell more items, you are violating amazon’s TOS and can get your account banned. If you get your account banned on amazon, there’s no recovering like with Google from a penguin. Well, actually penguin isn’t a penalty anymore after it became real-time, so that was a bad analogy! The point is you are screwed if you get your account banned on Amazon, so its always best to stay within their guidelines, or at least don’t break the important ones like launching a ton of products just to make more money. What helps products sell on Amazon? Amazon gets a cut of every sale made on its website. The company’s main incentive is, thus, to boost overall sales of a product. Amazon’s search engine is optimized to display products that tend to sell well. 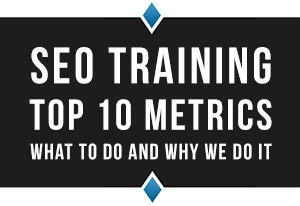 They rank higher on SERPs than products that are less likely to sell. There is a pretty cool software tool called AMZ Tracker out there but we have not tested it, so we can not vouch for them. It appears to optimize your product pages and increase sales from $50 – $400 per month. What determines whether a product will sell or not? As a seller, you must devise strategies to ensure that your product is prominently displayed on a SERP. This is because improving product discoverability increases the likelihood of a purchase. Shoppers are more likely to purchase a product on the first page of a SERP, than say the fifth page, so the higher your product ranking on Amazon’s SERPs, the better. Amazon’s product search ranking algorithm is constantly evolving. However, in order to maximize overall product sales, there are some definitive factors that Amazon considers when ranking products on SERPs. Amazon examines both relevance and performance indicators when sorting products. Relevancy – How well does the query match your product? Relevance factors are indicators of how well a search query matches product content while performance factors gauge how popular a product is with customers, which is reflected in product sales. Product content must be optimized to boost product visibility on SERPs. This is accomplished by using the right keywords to describe your product. The keywords used in your product content should match possible customer search queries for that product. This requires some level of strategy and comprehensive keyword research. Whether you do this through one of the many free SEO keyword tools available, or through another form of Amazon keyword research, this is very important. Product content includes a number of key aspects including product title, product descriptions, and features. Whiles sales and sales velocity trump all other factors, Amazon wants to show the products that sell the most and makes them the most money. However, in less or non-competitive niches, Titles are very, very powerful. 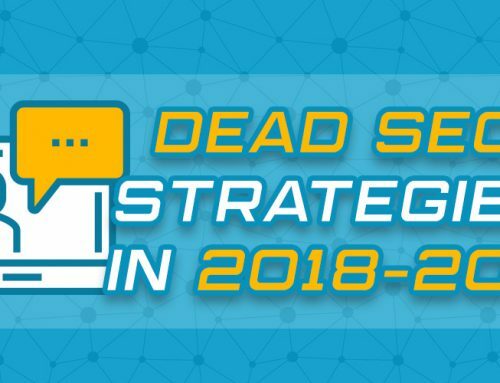 Also, just as keywords and finding non-competitive keywords are incredibly important to the success of any SEO campaign, so is finding the right level of competition/ volume for any given product or keyword. Product titles are one of the most weighted factors in an Amazon SERP ranking. The product title should include as much relevant information as possible to boost the product’s visibility. Per Amazon’s recommendation, include brand name, product line, type of product, material or key feature(s), size and color, as applicable. The problem with most Amazon product title optimization strategies is that your title ends up being diluted by a wide variety of keywords. I hate seeing stuff life that on Amazon titles. But, they do work. You are clearly trying way too hard to rank for the keywords Survival tactical knife, outdoor pocket knife, survival gear, among a few others. The problem is that another product that is labeled something more specific is going to rank higher for your search terms. Your title should be one of these terms; whichever best fits your product. 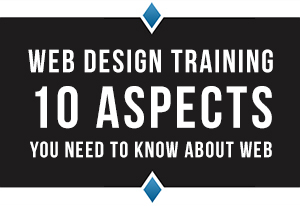 While you could be ranking number #3-#4 for multiple terms, there is more opportunity at #1. That is why you want to create three products, all targeted for each of these search terms and being as specific as possible. Repeat this process with 100 products and you will be making some serious sales on Amazon. Again, what you want to do, is create more products and make your product titles the exact search query without a ton of keywords stuffed into it. The defining features of a product should be included using relevant keywords. Product features should include keywords describing, for instance, product dimensions, ingredients, product benefits, materials and product use. Also, besides listing product features, adding product descriptions gives a seller the chance to include the most possible search query terms. Product descriptions usually employ persuasive language (using long-tail keywords) to encourage a shopper to buy a product and should be as robust as possible to maximize product discoverability. 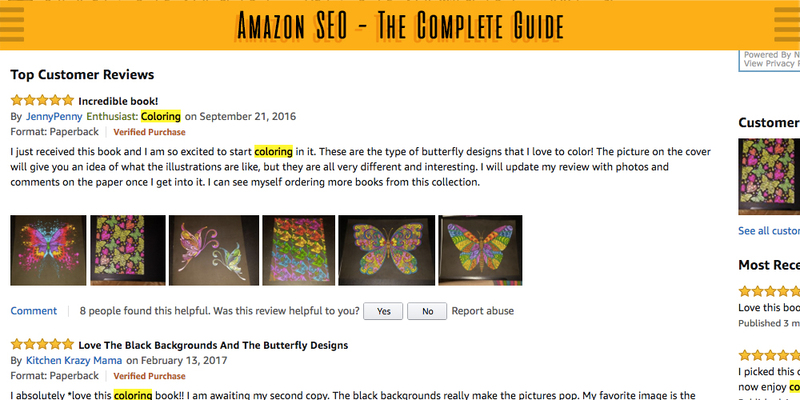 Take a look at the above screenshot of an amazon product page for coloring book entitled: butterfly coloring book for adults. This is a good example of optimizing for their main keywords. You can see the results of this since they rank on page one of amazon for their main term, which is high volume/ high competition keyword. 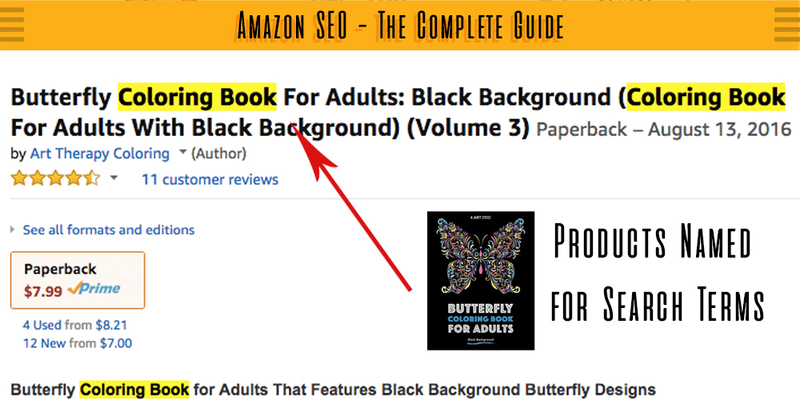 Considering they have less reviews than their competition and they rank on page one for a good keyword, it shows the power of optimizing your product title, description, and having a good product image (or in this case, a good book cover). Always completely fill out your technical details, this will further enhance the user experience in know exactly what to expect when the product arrives. Complete this section to th best of your ability and never leave any feilds blank. The keywords used in the product title carry the most weight in an Amazon SERP ranking. It is, thus, crucial to use keywords that are the most relevant to your product in your product title. Note that each keyword in the product title is searchable individually so the more relevant keywords in your product title, the better. Quick Tip: When entering in keywords for your product, avoid misspellings and repeating words. Also, make sure that you are using the proper punctuation and do not give false information about a product. Again, it is important to keep in mind that diluting your product title down with too many keywords can also hurt you. Try to keep your keywords and titles as specific as possible for Amazon product page optimization. NOTE: Amazon A9 is a caveman, Google is Einstein. 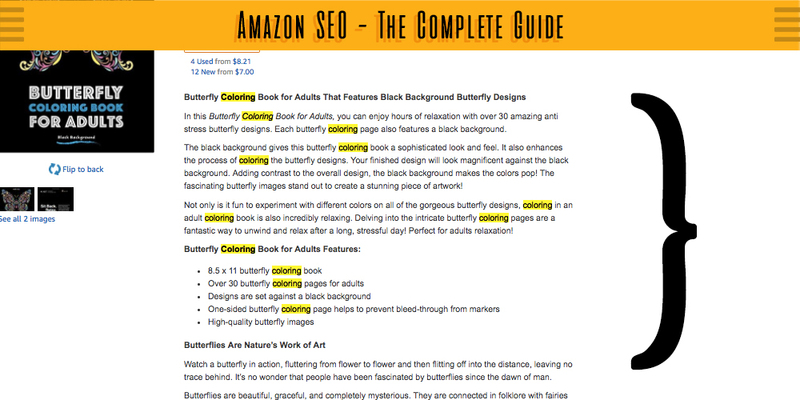 Amazon still has a lot of room to grow, so they don’t get that deep into keywords/ dilution/ mapping keyword variations like google’s humming bird, however, they still play a big part in ranking product pages. QUICK TIP: Name your products based on search terms in Amazon. The location of a keyword is also an important consideration in optimizing product discoverability. Not all keywords can fit into your product content listing. A seller has to prioritize the order of keyword placement as some keywords are more relevant than others to a product. To optimize your Amazon product page ranking, you should keep in mind the hierarchy of keyword location. So, the most relevant keywords should be entered in the product title, followed by bullet points, product descriptions, and additional keywords. It is important to note here that there is no guarantee that the keywords in your listing will end up being displayed on the product’s detail page. Amazon selects the best, HIGHEST CONVERTING content to show on a product page using its special algorithm. Sellers under the Amazon Brand Registry have greater control over the product content that appears on a product detail page. Only sellers who sell their own brand of product(s) are eligible for this option. This gives them the freedom to correctly title their products and list the relevant features, details, and images for their product. The keywords a seller under the Amazon Brand Registry chooses to use for a product are automatically displayed on the product page, bypassing Amazon’s algorithm for picking and choosing the keywords the website deems best-suited for a product. As we previously mentioned, Amazon gets a piece of product sales. A product with a high sales rank will not sell very much. A low sales rank sells often. So 1,000,000 sales rank may only sell 1-2 times a month for instance, whereas a 1,000 sales rank could sell multiple per day. This also depends on the category. Amazon is in the business of higher conversions, irrespective of the seller of the product and its SERPs reflect this. Bestsellers usually appear on the first pages of SERPs. Another way a shopper finds a product is using Amazon’s search filters. The Average Customer Review filter allows a potential customer to only view products that have a certain star-rating. Product reviews also affect product buyability. Well-reviewed products have a higher conversion rate than poorly reviewed products. A seller should consider receiving customer feedback on their products, especially if he or she is the sole seller of that product. So, how can you get “Amazon’s Choice” product tag over your product on Amazon? Customer Service needs to be a top priority (Either Amazon Fulfillment or really good in-house shipping and cx service). The product is affordable in its vertical (Volume is the key here) – Fast Nickle over a slow Dime. Products can either be fulfilled by merchants (FBM) or by Amazon (FBA). The big draw with a product that is fulfilled by Amazon is that it is eligible for Prime which comes with many benefits such as free 2-day shipping, for example. As a seller, you should assess whether or not to offer your products using FBM or FBA. This will depend on your competition and Buy Box ownership percentage. Advertising your listing is a great way to boost your product’s visibility on Amazon. These ads usually appear on the first page of SERPs or on product detail pages. Sponsored products is a good solution for products with little to no sales performance history. They expose your products to a new audience which, in trun, boosts product sales. Product Buyability encompasses the elements that affect the conversion rate of a product detail page. It is not enough to have your product display prominently on Amazon’s SERP. Do page-viewing shoppers actually convert into actual buyers? The two concepts – product discoverability and product buyability – are interrelated. Improving product discoverability boosts the likelihood of potential customers landing on a product details page which, in turn, increases the probability that the product is bought (product buyability). This, in turn, affects sales performance history which influences product visibility on a SERP. This refers to the factors that affect the overall conversion rate of a product detail page. Basically, this involves analyzing the different elements that influence overall product buyability, irrespective of the seller. Using product content strategies such as the right relevant keywords, a seller can boost product visibility and in turn, increase the conversion rate of a product. This strategy is best for brands and sellers that have unique products and little competition in the Marketplace. Third-party sellers have to compete with other sellers of the same product. The goal of this type of seller on Amazon is to have a large percentage of the Buy Box share for the product being sold. An Amazon Buy Box is found on a product detail page. It is the box that allows customers to begin the process of purchasing a product by adding it to their shopping cart. A seller’s goal is to maximize his or her ownership percentage of the Buy Box. For example, let’s say you sell Gerber Pocket Knives and overall, a total 200 of these pocket knives are sold on average every month. Your goal would be to increase your percentage share of the Buy Box so that you are the dominant go-to seller of Gerber Pocket Knives. When it comes to good marketing strategies for your product, product discoverability and product buyability are highly interconnected. You must strategize accordingly to ensure that your product is highly visible on Amazon’s SERP while also ensuring that you end up being the chosen seller for the product. This can be a bit tricky as it is possible to strategize to have an optimized product content for SERP rankings but still lose out on a sale if you do not have a high share of the Buy Box for that product. Basically, you are optimizing product content for your competitor with a higher Buy Box share than you! One simple answer is when you have a high percentage Buy Box ownership of the product. In those instances where you might not have the highest share of the Buy Box, you have to carefully analyze your product sales to determine the best strategy for your business. It is a bit of a balancing act that requires thorough assessment of your sales performance in order to prioritize your resources and time accordingly to gain the best sales outcome and boost your Buy Box share. Once you have successfully increased your Buy Box share for a product, you can then switch your focus to strategizing to boost the number of total orders for that product. Other factors that affect product discoverability happen on the off page side as well. Besides product content, there are many other factors that affect product ranking on Amazon’s SERP and Google’s SERP. These off-page link building factors can make for a huge increase in overall sales, conversions, profit, and growth. Backlinks to your product page URL will increase that specific page’s ranking in Google SERPS. If you have multiple links from websites all pointing to one product URL on Amazon, Google is more likely to rank that page for certain search terms when someone is searching for that product or that keyword. 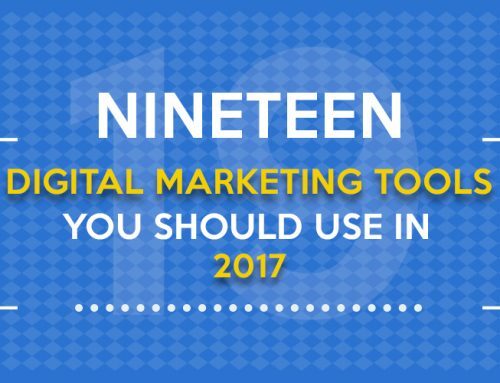 The goal here is to start building links from around the internet to your specific product page. The more links pointing to your product page URL from websites around the net, the higher up you will rank in Google SERPS. Doing this will also build that pages PA (Page Authority) not to be confused with DA (Domain Authority). Building your pages PA in combination with Amazon’s already mind blowing DA will give you a leg up in keyword searches and specific product searches in Google. 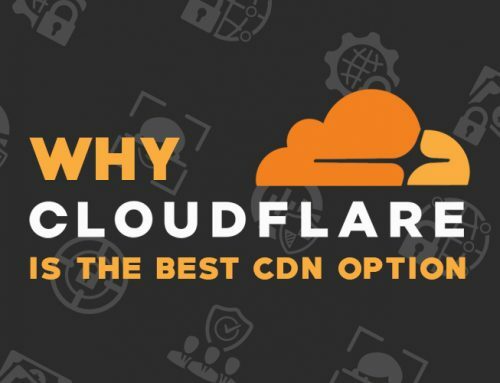 So, where do you get backlinks for your product page URLs? Easy, Guest Posts (Guest Blogging). A similar strategy used in everyday inbound marketing campaigns, guest blogging is when you reach out to other blogs and submit content to their website in exchange for a backlink. How do you guest post or guest blog on someone’s website? There are hundreds of ways to get backlinks, you just have to do a little research. Every market is different so it is important to do your research before you go out and ask for links. After you have established your backlink plan of action, then consider your anchor text for SEO and how that will play into your Google ranking. Anchor text is the actual text within the hyperlink you are linking with. 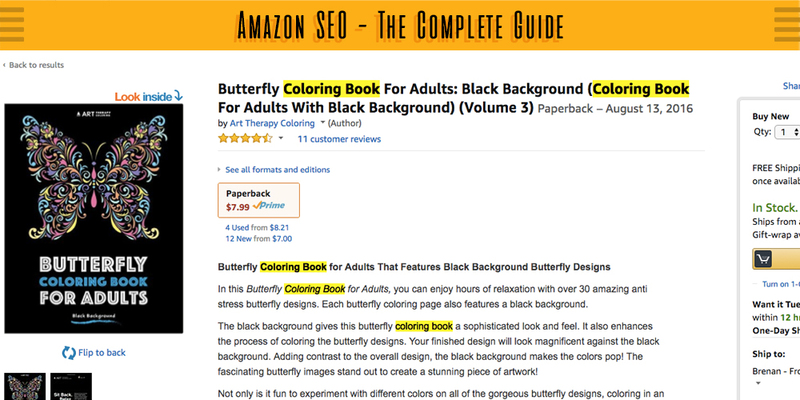 For example, if you are selling coloring books on Amazon, you may want to use the term “Voted Best Adult Coloring Book on Amazon” as your hyperlink text. This is going to tell the search engines that the page you are linking to is all about… the Best Adult Coloring Books on Amazon. There are hundreds of long tail search terms around Amazon keywords every day. This is an area that you need to optimize heavily from an off-page Amazon SEO perspective. If you were to start linking to your product page URL with the anchor text “Best Adult Coloring Books for Men Amazon”, your page will start ranking higher in Google for that specific keyword. Leveraging your eCommerce website for backlinks is a must to start ranking your product pages higher in Google SERPS. The strategy is simple. Write a blog post for every item you sell on Amazon and link out to that product page URL with keyword-heavy anchor text. The more products you have on Amazon, the better. This will give you the opportunity to write more content, become an authority in your market and grow your business faster than if you had one product. When you are moving your products to Amazon, it can be a gold mine. Keep yourself informed about all the areas to optimize and you will do just fine. The process for Amazon SEO and ranking your product pages higher is pretty simple if you follow the steps above. 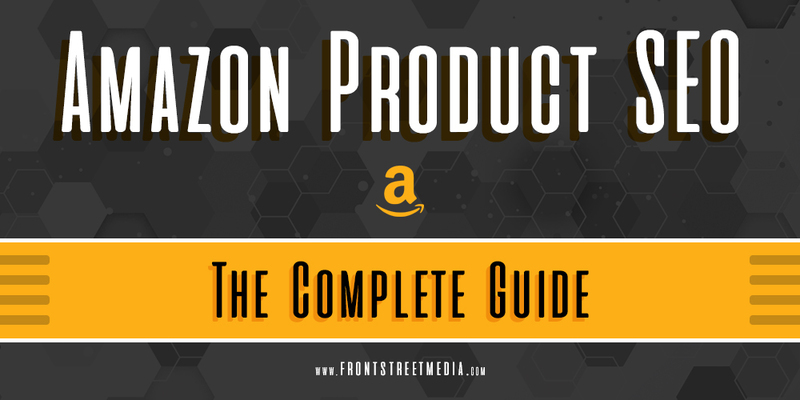 Thanks for checking out our step by step Amazon SEO guide. Please comment below if you have any words of wisdom to say. We welcome any and all items we missed and did not discuss in enough detail. For more information on ways to boost your Amazon SEO using strategies to improve product buyability and product discoverability, contact the team at Front Street Media.